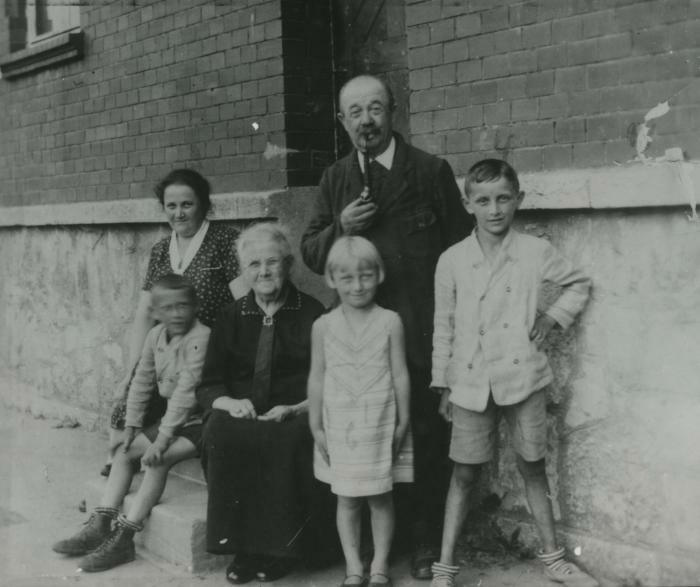 Administrative/Biographical HistoryThe Rosengartens were a Jewish family who lived in Themar, Thüringen, Germany, until their escape to Shanghai, China, in 1939. The documents in this fonds pertain mostly to Manfred Rosengarten (b. July 15, 1921, in Themar, Thüringen, Germany) and his son, Andrew Manfred Rosengarten (b. April 8, 1950, in Martinez, California, United States). Manfred Rosengarten was born to Paul Rosengarten (b. 1883 in Witten-Herbede, Germany; d. 1953 in Contra Costa, California, United States) and Berta Schwab (b. June 15, 1893, in Themar, Thüringen, Germany; d. February 24, 1948, in Hartford, Connecticut, United States). He had a brother, Erich Rosengarten (b. November 27, 1922, in Themar, Thüringen, Germany; d. August 23, 2002, in Barnstable, Massachusetts, United States). Before the war, Paul, Manfred and Erich were interned at Buchenwald concentration camp. According to family accounts, they were allowed to return home because Paul, a cavalry officer in the First World War, was reacquainted with a fellow soldier who helped them escape. In 1939, shortly after returning to Themar, Paul, Manfred and Erich, as well as Berta and her brother, Oskar Schwab (b. February 16, 1890 in Themar, Thüringen, Germany; d. December 17, 1972, in Hartford, Connecticut, United States), traveled to Genoa, Italy. On May 30, 1939, they boarded the SS Conte Biancamano and went to Shanghai, China, where many Jewish refugees escaped to during the war. While in Shanghai, Paul and Erich worked for the United States Air Force shipping supplies to Chiang Kai-shek. In 1945 Manfred earned his goldsmith journeyman certificate. On July 15, 1947, the Rosengartens and Oskar Schwab left Shanghai aboard the USNS Adder. They arrived in San Francisco, California, on July 27. Manfred stayed in California, settling in Martinez and finding work as a jeweler. The rest of the family moved to Hartford, Connecticut. Manfred married Eveline Rosa Berger (b. May 12, 1928, in Berlin, Germany; d. February 17, 1996, in Walnut Creek, California, United States), a dressmaker, in 1949 and they had two children: Andrew Manfred Rosengarten and Linda Charlotte Rosengarten (b. July 4, 1951, in Contra Costa, California, United States). Eveline had also escaped to Shanghai during the war with her family, shortly after Kristallnacht. She and Manfred met on the SS Marine Adler. In around 1951 Manfred had to close his jewelry store. He found work in plant operations at Shell Chemicals Company in Pittsburg, California. When the refinery was shut down in 1967, Manfred resumed work as a jeweler. In 1983 Manfred, compelled by homesickness, decided to compile a scrapbook about Themar so that he could pass his memories on to his children and grandchildren. The sister of his friend in California agreed to travel from her residence in Dresden, Germany, to Themar to take photographs for the scrapbook. Soon after Manfred began his scrapbook, he reconnected with his childhood friends who sent more photographs and postcards. Manfred died November 1, 1987, in Martinez, California. Andrew currently lives in Surrey, British Columbia. Scope & ContentFonds consists of scrapbook and supplemental materials, correspondence, photographs and family history documents relating to the lives of the Rosengarten family. Fonds has been arranged into the following series: Themar, Thüringen scrapbook series ([192-]–1983), Manfred Rosengarten correspondence series (1981–2008), Andrew Rosengarten family history documents series (2000–2002), Rosengarten family photographs series (1986–[200-]), Rosengarten family artefacts series (circa twentieth century) and Rosengarten family collected books series (1942). Immediate Source of Acquisition or TransferScrapbook, correspondence and photographs maintained by Manfred Rosengarten until his death in 1987. Materials were in the possession of Andrew Rosengarten prior to their donation to the VHEC in 2008, 2009, 2010, 2013, 2017 and 2018. AccrualsFurther accruals are not expected. System of ArrangementThe original order of the fonds has been maintained where it was discerned. Fonds has been arranged into five series, which reflect the major activities of the Rosengarten family, as well as thematic divisions as it came to the VHEC. Date of DescriptionPrepared by Sarika Kelm in November 2016. Updated July 17, 2017. Existence and Location of Originals"Mentschlikhkeit," article by Sharon Meen, published in Zachor no. 1, January 2008, pages 8-10. Fonds consists of scrapbook and supplemental materials, correspondence, photographs and family history documents relating to the lives of the Rosengarten family. Fonds has been arranged into the following series: Themar, Thüringen scrapbook series ([192-]–1983), Manfred Rosengarten correspondence series (1981–2008), Andrew Rosengarten family history documents series (2000–2002), Rosengarten family photographs series (1986–[200-]), Rosengarten family artefacts series (circa twentieth century) and Rosengarten family collected books series (1942).